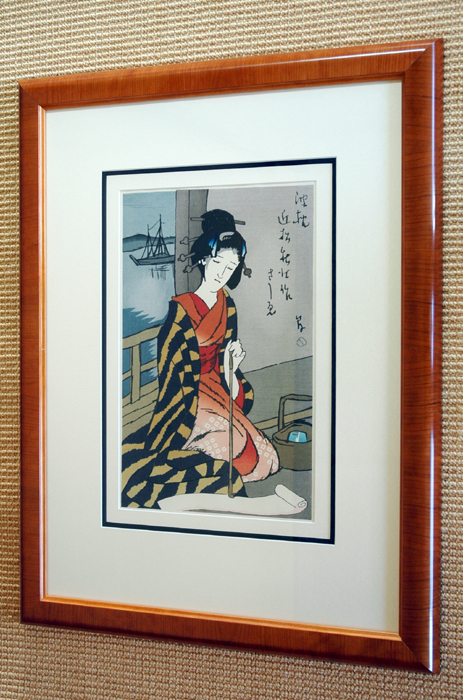 Our customers often ask us how to go about framing their Japanese prints. 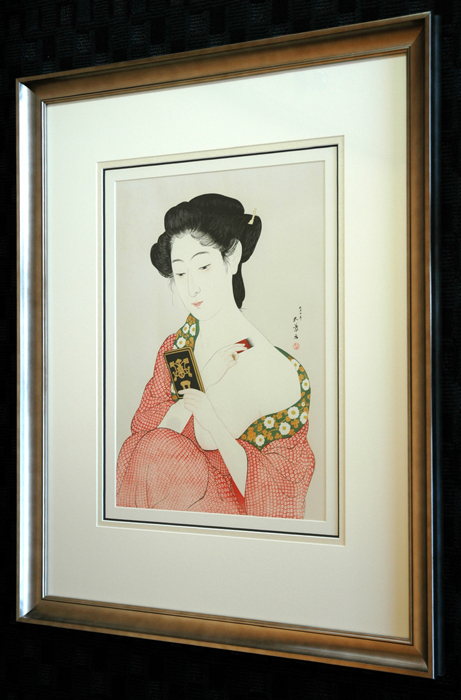 In our 20 years of gallery experience, we created custom framing for hundreds of Japanese prints. We would be happy to help you with some design ideas and some tips on different parts of the framing process. A good framing job can really enhance a print and make it a fantastic display for your home. While many stores have ready-made frames of varying quality, they only offer a few standard sizes and a very limited number of styles. Also, you will still need to have your print mounted and matted prior to framing, and this can really only be done by a framer. 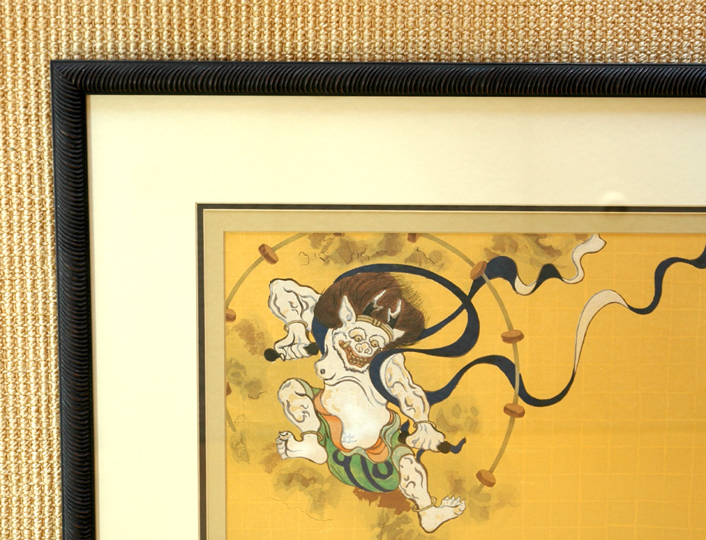 We highly recommend taking your prints to a professional custom framer. A custom frame shop has hundreds of frame profiles and matting options to choose from, custom sizing that will be appropriate for your specific piece, and they can assist you in designing your framing. 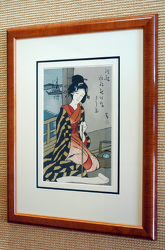 There are many framing design options that can be used successfully on Japanese prints. We find it works well to go with the Japanese aesthetic of simplicity, with a clean uncluttered look that does not compete with or detract from the artwork. If you’re not sure what you like, look around in design magazines or online to see what others have done. It might give you an inspiration or a starting point. Simple rectangular profiles are nice, but any shape that is clean-lined without too much ornamentation can work. 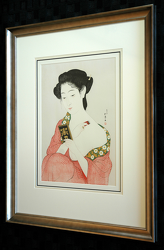 Black is a classic color choice for Asian art. I prefer a matte finish, but shiny lacquer is good too. Natural wood finishes are excellent too, with cherry, mahogany and walnut being popular choices. Silver or gold finishes work well with some prints, but I try to use ones that are not too bright. Look for ones with red undertones, striations or a more dull-colored gold or silver finish. Some frames have a sort of antique or distressed finish. This can look great on some prints, but be careful to choose one that doesn’t look too manufactured and unnatural. Before your print goes into a frame it will need to be mounted on a backing board. Then a decorative mat board border may be used over this. The mat border provides a clean edge around the print, and can be used to cover damaged edges of a print. It is good to show as much of the subject as possible. If your antique print has good margins, you will probably want to show them. With any print, margins that include a signature or other pertinent information should be shown. A print may also be float mounted, which means it is mounted without a top mat covering the edges. It is mounted to a decorative backing board and appears to “float” on it, with the backing board used as the surrounding border. This is good for prints where the subject goes all the way to the edge of the paper or for prints on hand-made paper where the edges are interesting and add character to the piece. In choosing mat colors, simplicity is again suggested. The most versatile and popular choice is an off-white that goes well with the color tones of the print. You may choose to use this as a single mat or go with multiple layers, just don’t let it get too busy-looking. Sometimes a black top mat will be very dramatic on the right piece, but for many prints it is overwhelming. Also consider how the mat colors work together with the frame. Cotton rag mats are the most common and look great, but fabric mats can add elegance to the right pieces. 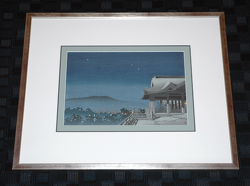 Also, use a border that is wide enough so that the frame doesn’t appear to crowd the print. 3”-4” is good on many pieces, but there is no set rule. A custom framer should be able to show you various color, material and size options so that you can choose what works best for you. 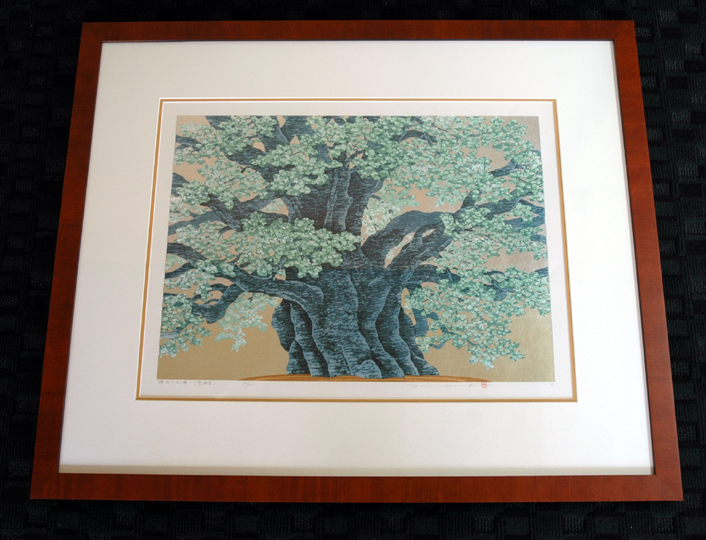 In having your print framed, it is very important to do it in a way that will preserve it. Conservation framing involves using all acid-free mats, backing boards and mounting materials. Make sure that your framer is doing this. It doesn’t cost much more, and you don’t want to see your print develop mat burn, toned paper, or be unable to take the print out later. Not only would that look bad, but it would destroy the value of the print. A final consideration is the type of glass to use. I would only use a conservation type of glass that blocks most UV rays. Without it, you will see fading of colors in your print and the mats, even if it is not in direct sunlight. There are various types of UV glass available, and your framer can show you these. We hope that you found this information helpful. Good luck and enjoy your framing projects, the process should be fun!